Painted on the pattern around 1900. Realized many views of etretat. To be visibly related to the author of this panel. Painted at the same time. Carry on the back the trace of a supplier stamp. In violet ink, very largely erased. A purple stamp that is very likely the same. Figure in more net on another panel. From the same artist I sell. Buffer of the house lefèbvre lécluse. Active at 58 rue de Clichy to parties. From 1893 to 1898 under the name of lefèbvre. Then from 1898 to 1910 under the name of lécluse. 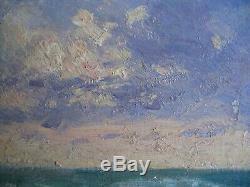 Stylistically, this painting is very close to claude monet. Very good condition, slight crack in the middle, invisible except close. Very light wood panel to paint outdoors. Beveled by hand with a plane. 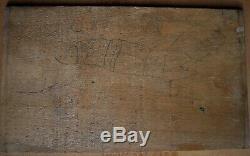 Table: approximately 24 x 14 cm. Subject, period and style very rare. See also my other sales. 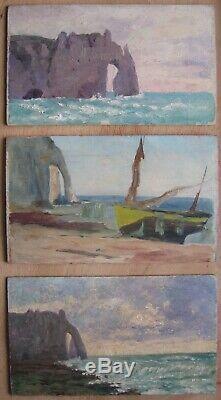 3 impressionist etretat views by the same artist. Paris is, vincennes, saint-mandé, montreuil ... All my objects are carefully packaged. All items are carefully packed. Reduced shipping fees for multiple purchases. 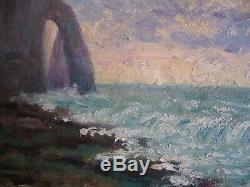 Impressionist impressionist degas manet monet french old master painting antique oil painting. Claude Monet Henri Morisset Henry Moret. 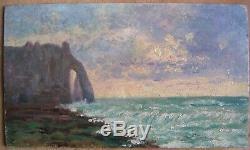 The item "very rare subject and era etretat 2 impressionist painting close monet marine" is on sale since Friday, February 8, 2019. It is in the category "art, antiques \ art of the nineteenth and before \ paintings, enamels". The seller is "capitobis" and is located in / in vincennes. This item can be shipped to the following countries: united states, european union, japan, canada, australia, switzerland, russia, federation of.